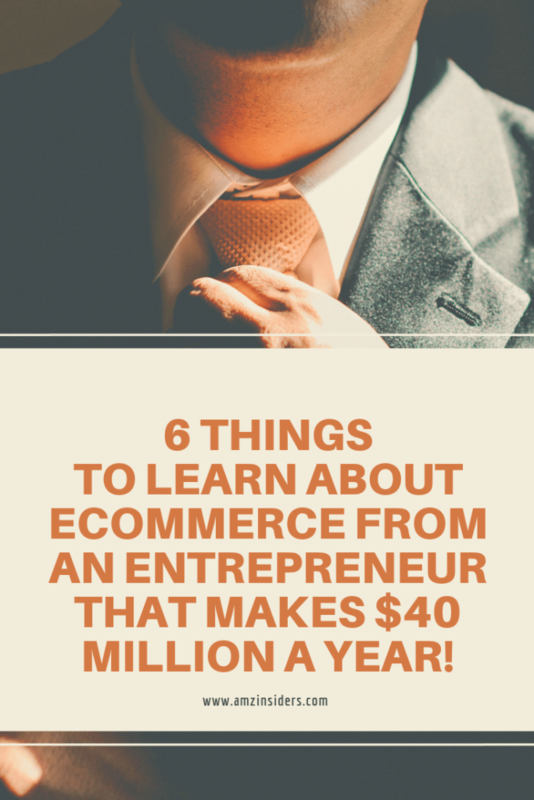 6 things to learn about ecommerce from an entrepreneur that makes $40 million a year! This week on the podcast, I sat down with Brandon Poulin to discuss some expert tactics to quickly grow your ecommerce business. As the CEO and co-founder of LadyBoss—the first global weight loss system and support community for women—he, with his wife, has helped transform the lives of over 140,000 customers around the world while accumulating tens of millions of dollars in revenue. They have completely destructed the weight loss industry and built an empire from the ground up. Only four years ago, Brandon and his wife brainstormed the idea for a weight loss company they would open on their own. With the intention to serve the average American woman, they launched product lines, grew a team and community while providing only the best products, service, and information. Brandon shared a wealth of advice and inspiration with us that is valuable to any entrepreneur at any stage of their business. If you need ideas for time management, marketing, or team building, you’ll find his experience extremely helpful. After sharing the history of his business and why he and his rockstar wife started LadyBoss, Brandon dove right into the heart of starting a company. 1. Anyone can sell a product, but not everyone can create a customer. If you have something people can trust and follow up, you have a real asset. One trick he mentioned is to type in your company name in Google and set up a Google alert. This gives you an opportunity to see what people are saying about your company. He has a team member in control of these instances who can reach out and handle complaint protocol. Be protective of your brand and its reputation. You only have one shot because when it’s out there, it’s out there. But building a brand is really more than selling products. For LadyBoss, it’s a community of inspiration. Facebook communities are powerful. If you can get people together, there’s massive power. Every customer, no matter what they buy, is invited to join the LadyBoss Facebook group. This creates connection between customers, something that just didn’t exist ten years ago. With over 37,000 people engaged daily in the group, that’s taking brand to a whole other level. This gives them a place to facilitate and grow as a customer. 2. When building your team, look for 3 traits in an employee: character, commitment, and confidence. People are often scared of growing a team, mostly for fear of losing control. But delegating responsibility frees up more time for professional growth which would benefit the company. Finding people who are passionate, with that all-in commitment means more people with passion for the company’s future. Those three characteristics are more valuable than training. Training can be acquired, but passion and commitment is key. You have to give people responsibility if you want them to be responsible. It’s a great feeling to watch your employees take ownership and achieve company goals. Give them a scoreboard and something to achieve, and they’ll surprise you. Suddenly, instead of one person pushing your business forward, you have sixty people pushing it forward. Pushing a business forward means creating and maintaining its brand. When it comes to branding, Brandon mentioned the importance of building a community of people and customers. 3. If you’re consuming information that you can’t execute immediately, you’re wasting your time. Today’s society is so full of information, it’s become a lot of noise. Everyone is desperate for information when what they need is wisdom. If it’s not something you can implement immediately, it’s likely that you’ll never implement it. You can take notes and plan for the future, but why not dive into a course or book that you need right away? Ask yourself: what is the action I’m applying this information to? And if you can’t answer that, it could be a waste of time. Don’t just learn it to learn it. Be intentional about what you consume. Focus, learn, and grow. As for the people Brandon does follow, he credits Russell Brunson, CEO of ClickFunnels as an inspiration in marketing. According to Brandon, Russell is someone who is always evolving, always learning, then always teaching. Along with Russell, Brandon even mentioned following Jesus as a source of inspiration in his marketing and growth: the first entrepreneur, he said. Brandon really stressed messaging and mindset. Setting yourself up for personal growth and development means knowing what can be improved and sucking in all of the information necessary to improve it. Observe someone successful, set your expectations, and be quick to learn. But Brandon doesn’t do it alone. Over the four years, he expanded his team from two to sixty. Sure, you could do it alone and live a laptop lifestyle. You might make hundreds of thousands, but if you want a bigger impact, you can’t do it alone. 4. Make your schedule reactive. When it comes to organization and efficiency, Brandon shared his team’s strategy. Making your calendar reactive means planning every day of the week and living by the calendar. 1. First, put all ideas, to-do lists, and notes into an action item list or airlock. Brandon shares a database with his team so that he can see what everyone is working on and delegate tasks easily. 2. Once a week, prioritize the items on that list and categorize them for board planning. 3. Last, put everyone of those items into the calendar. Don’t just use to-do lists. By giving those action items a set time of completion, you will find yourself getting more done and moving forward. With this system, Brandon and his team get twice as much done than before. So, ask yourself: what do I need to grow right now? Then, put that in the calendar. Discipline yourself to plan and implement the calendar. Do what your business needs when it needs it. It’s that simple. Brandon is running a multi-million dollar company with Google Sheets and Docs. He doesn’t worry about trying to force his business into a fancy program, but he takes a simple system and uses it effectively. Don’t get off track or waste time. Exercise intention. Speaking of wasting time. Brandon’s next point was one that is very relevant for today’s entrepreneur. 5. Find a mentor or model success and watch what they are doing. Whatever angle you want to use for marketing your company, find someone who is doing that successfully now and watch what they do. It’s not about luck or opportunity. It’s about discerning who and what you listen to when running your business. 6. Building a company is one of the hardest but most exciting things you will do. No matter what you’re selling, your product must add value, big or small, and you have to be absolutely passionate about it. When you hit the walls, and you will, you’re either going to break down or breakthrough. If you’re only in it for the money, and there’s nothing wrong with it if you are, but you are only limiting yourself and your business. Diving into the heart of your company can reap major rewards. Don’t just aim to sell products, but learn how to change lives. Brandon recently took his business to Amazon to reap the benefit of the overall traffic the site receives. “It’s a no-brainer,” he says. People will find them because they’re on Amazon, and if someone finds them elsewhere, they’re very likely to still purchase their products through Amazon. Although with a shelf of awards from ClickFunnel for multi-million dollar sales, Brandon clearly has the insight and skills to run his business efficiently. His advice was concise and clear: figure out a message that will sell and consistently deliver. Spreadsheets are great, but they don’t matter if you don’t have money coming in. Marketing always comes first, but be adaptable and ready to learn because it happens fast. 2018 is an incredible time to be an entrepreneur. Should you be worried about Amazon’s underground economy?